Fourth Row Center: Film Writings by Jason Bailey: On DVD: "T.A.M.I. Show"
For decades now, one of the most keenly sought unavailable-on-video movies was T.A.M.I. 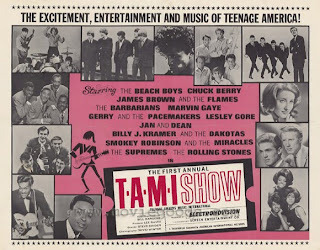 Show, a 1964 rock concert film with a stunning line-up of famous rock and soul acts: The Rolling Stones, the Beach Boys, James Brown, Marvin Gaye, the Supremes, Chuck Berry, Jan and Dean, the Miracles, and many more. Indeed, the financial and legal issues entailed by that kind of a line-up were what kept it out of circulation for so long—obviously, releases and contracts didn’t yet include clauses licensing performances in perpetuity, on any future media, etc. The film remained a prize bootleg for years primarily due to the efforts of the Beach Boys, who had their performance snipped from all prints after the initial theatrical run (perhaps because they’re so comparatively dull in it? Just spit-balling). This year, at long last, it finally made its way to DVD in a full, authorized version, and it is a wonder to behold. The value of the picture can’t be understated—and not just for the music, though it is (expectedly) phenomenal. After a brief opening credit sequence, in which the film is incorrectly titled Teenage Command Performance (indicating that the disc may have been mastered from the so-titled UK release) and Jan and Dean croon the specially-prepared “(Here They Come) from All Over the World” over footage of the acts on the bus, in rehearsals, in dressing rooms, and fooling around in the streets, the real show begins. Recorded over two nights in October 1964 and stiffly hosted by Jan and Dean, the first section is a back-and-forth between Chuck Berry and Gerry & the Pacemakers. Berry, hoisting a monster Gibson guitar, kicks the show off right with a spirited performance of “Johnny B. Goode,” bolstered by the inventive background dancers (including a young Teri Garr). He then moves on to “Maybelline,” sung from under raised eyebrows, which segues into the Pacemakers’ respectable if comparatively low-energy cover of the same tune. Goofy diffusion takes over the edges of the screen for their performance of the ballad “Don’t Let the Sun Catch You Crying,” but they bounce back hard with a wicked “It’s Gonna Be All Right,” which nicely mixes the Mersey Beat with a dark, soulful edge. Then it’s back to Berry for a terrific, abbreviated version of “Sweet Little Sixteen,” back to Gerry & the Pacemakers for “How Do You Do It?”*, then to Berry for “Nadine.” It’s an enjoyable session of song-trading, and the Liverpudlians do their best to keep up with rock groundbreaker Berry. Next up are “the Miracles” (not yet identified to include the name of lead singer Smokey Robinson), performing “That’s What Love Is Made Of,” about as harmless a tune as you can imagine (“snakes, snails, puppy dog tails…”). They move on to a passionate “You Really Got a Hold on Me”; Smokey looks impossibly young here, and though the group is lively, his voice is a tad squeaky (particularly on “Mickey’s Monkey”). Marvin Gaye keeps the Motown vibe going with abridged but ripping renditions of “Stubborn Kind of Fellow” and “Pride and Joy” (both given slightly faster, more horn-heavy arrangements by house band The Wrecking Crew). He’s in fine voice for his finger-snapping performance of “Can I Get a Witness,” flanked by two furiously shimmying hotties; “Hitchhike” is equally soulful, though we do get a bit of Marvin’s unfortunate dancing. Hosts Jan and Dean get their turn to sing next, with an enjoyable swing at their “Little Old Lady from Pasadena,” followed by the forgettable vanilla anthem to skateboarding, “Sidewalk Surfin’.” But they’re a sensible lead-in to the Beach Boys, who do four numbers. Full disclosure: I’ve never been much of a fan of the group, and find it rather ironic that they were such a roadblock to T.A.M.I. Show’s viewing for so long, since they’re so far from the best thing in it. But “Surfin’ USA” and “I Get Around” have a high, infectious energy, “Little Surfer” showcases their trademark tight melodies with ease, and “Dance Dance Dance” moves along at a nice clip. Billy J. Kramer and the Dakotas follow suit, with a subdued “Little Children” and enjoyable runs through three consecutive Lennon-McCartney compositions: “Bad to Me,” “I’ll Keep You Satisfied,” and “From a Window”. All are good, though the group’s stage presentation is a little dull. The Supremes (as with the Miracles, they were not yet “Diana Ross and the Supremes”) zip through “When the Lovelight Starts Shining Through His Eyes” and “Run, Run, Run”; both are fun, though the trio is nearly overshadowed by the effervescent background choreography. “Baby Love” is evocative and toe-tapping, while “Where Did Our Love Go” hits the backbeat harder than usual and sends the crowd into a frenzy. In the midst of these immortal acts, we next have the Barbarians (who? ), whose song “Hey Little Bird” wouldn’t make much of an impression if it weren’t for our fascination with the group’s drummer, Victor “Moulty” Moulton, who is clearly drumming with a prosthetic hook for a left hand. Before we can even wrap our heads around that, it’s time for the star of the show: James Brown, with his then-regular backing group the Famous Flames. JB comes on strong with “Out of Sight” and doesn’t let up—his sheer joy of performance is downright electrifying. “Prisoner of Love” is likewise a scorcher; the way he snatches the mic and drops to his knees with a soulful screech, all in one fell swoop, is stunning. We get the full-on cape show for the extended “Please Please Please”—this is a consummate showman at full power, the dirt caked on his knees by the end a testament to the force at which he’s hitting that stage and popping back up. Their blistering mini-set ends with “Night Train,” working the crowd with their syncopated dancing, and Brown’s amazing dance solo at the end is dazzling; in close-ups, he’s soaked in sweat, and you can see why. You almost feel sorry for the Rolling Stones, having to follow Brown and the Flames, but they do the best they can to keep the energy up. “Around and Around” is rousing, a tasty slab of their early, more clearly R&B-infused period, while “Off the Hook” is clean, bouncy fun. “Time is On My Side” is expectedly terrific, while their take on “I Used to Love Her” is tough, primal, bruising. Their best number, however, is “I’m Alright,” which has the free-floating looseness of a good jam session (in stark contrast to the abbreviated tightness of even the best performances in the picture); it’s Jones-era Stones at their best. Finally, the Stones are joined by performers for the entire show for “Let’s Get Together,” which is fun to watch, though it seems to fade out just as it’s getting interesting. The music in T.A.M.I. Show is superb, the staging simple (using the frolicking dancers on stairs and platforms in a leveled, American Bandstand-style set-up) but effective, and the direction, though on-the-fly (director Steve Binder used his Steve Allen Show crew), is occasionally inspired—the slow booms up and down on “It’s Gonna Be All Right” and “Please Please Please” are ingenious, and the tight close-up of Diana Ross’s expressive face on “Where Did Our Love Go” is priceless. But it’s more than just a good concert film; it captures a moment of cultural and musical explosion. It’s a document of post-Elvis aural integration (nay, miscegenation)—all styles are welcome, from Motown to Mersey, R&B to funk, surf to blues, pop to garage, whatever moves the teen audience, whatever makes them scream, it’s all rock & roll. Within the context of what was happening in the country at the moment—the concert was mere months after the disappearances of James Chaney, Andrew Goodman, and Michael Schwerner in Mississippi, as well as LBJ’s signing of the Civil Rights Act of 1964—some of the film still has a subversive kick to it. Those white girls in their little bikini bottoms shaking it behind the Motown groups must have been a racist’s nightmare come to life, to say nothing of Chuck Berry singing “Sweet Little Sixteen” leeringly as a pert, foxy blonde preens behind him (the moment is even more incendiary in the afterglow of his 1962 conviction for violation of the Mann Act). 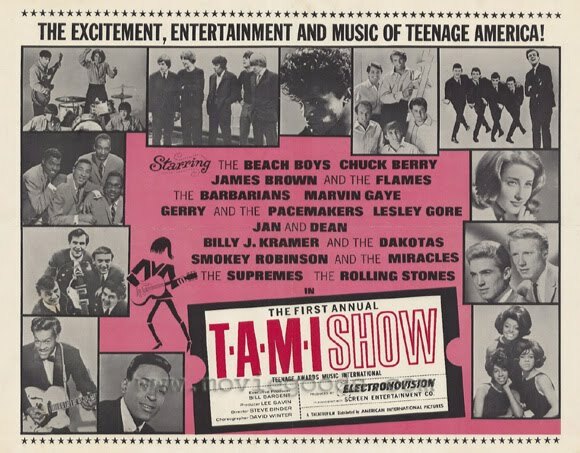 In October 1964, Motown was on the rise, the Beatles had taken over the world, and all bets were off—and, without even intending to, T.A.M.I. Show may be our greatest document of that specific, ebullient moment in American music and American life. It’s a must-see. * "How Do You Do It?” is an interesting pop footnote song—it was the tune that George Martin wanted the Beatles to issue as a follow-up to “Love Me Do,” and he even got them to record a rather listless version of it. But they wanted to put out one of their own songs, and revised their mid-tempo “Please Please Me” into the fast-paced hit single that Martin was looking for. "T.A.M.I. Show" is available now on DVD. For full A/V and bonus feature details, read this review on DVD Talk. Saturday Night at the Movies: "Ballast"
In Theaters: "Life During Wartime"
On DVD: "A Town Called Panic"